For drying your wet hands in the bathroom or For everyday cleaning and wiping tasks. Fits most 8" 'standard' dispensers. 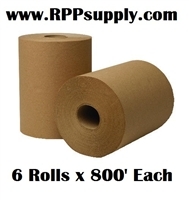 These 8" Natural Brown Hardwound Dispenser Roll Towels are great for use in Adult or Child Daycare, Preschool, Montessori & K-12 Schools, Hospitals, Group Homes, Child Care Centers, Assisted Living, & Home Use. Great Quality & Economical!